nteresting scrambler on eBay, no visible frame numbers, so it will have to remain an “off-roader”, but it’s got visible engine numbers. The fish-tail exhaust is pretty cool! By the expressions on their faces, whatever race was about to start wasn’t ‘just for fun’… these girls were taking things pretty seriously! 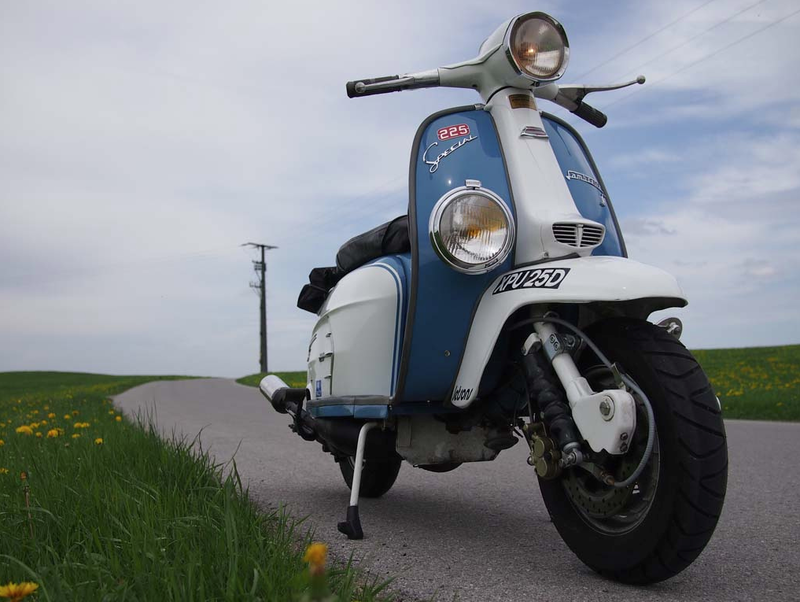 I don’t know a lot about this shot, but it’s great… I just had to reach into my ’emergency stash’ as I couldn’t leave a Vespa, no matter how beautiful, sitting as the first post on a Lambretta blog. Nothing against our Wasp riding brethren, but it’s just not right. There’s some lovely scooters including an S-Type (Ridden by a Bev?) but I think the old D still looks ‘competitive’ …although the rider seems less professionally attired! There’s legshield banners for The Innocents Lambretta Club Kent, and TheLambretta Club London. If you can add any more info, or identify any of the participants, please do! I love old pics like this, and if you’ve got any you would like to share on the blog, get in touch and we’ll get ’em up. I don’t normally post Vespa’s. 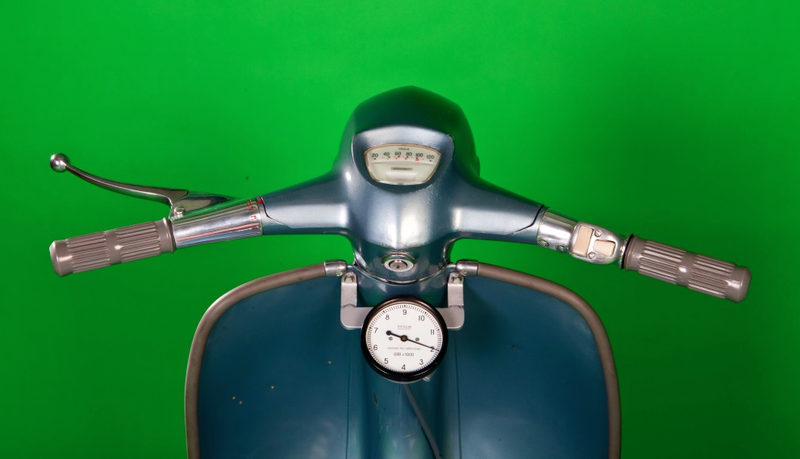 This is a Lambretta blog! But this I spotted a pic of this gorgeous machine on Twitter, and found a few more online. And it’s a superb looking machine, completley up my strasse. It’s for sale on eBay at the moment, in Germany. I don’t know anything about it, other than it is called a “Sei Giorni” Race Replica… Now, my limited Italian translates “Sei Giorni” as Six Days, and that automatically get me thinking of the Scottish 6 Day Trials, but I may be completely off beam here. There were probably a ton of 6 Day Competitions back in the day. Any Vespa enthusiasts / knowledgable scooter sport historians on here can shed any more light? Please let me know in the comments. There’s a german website address on the eBay page, but it doesn’t seem to work for me. 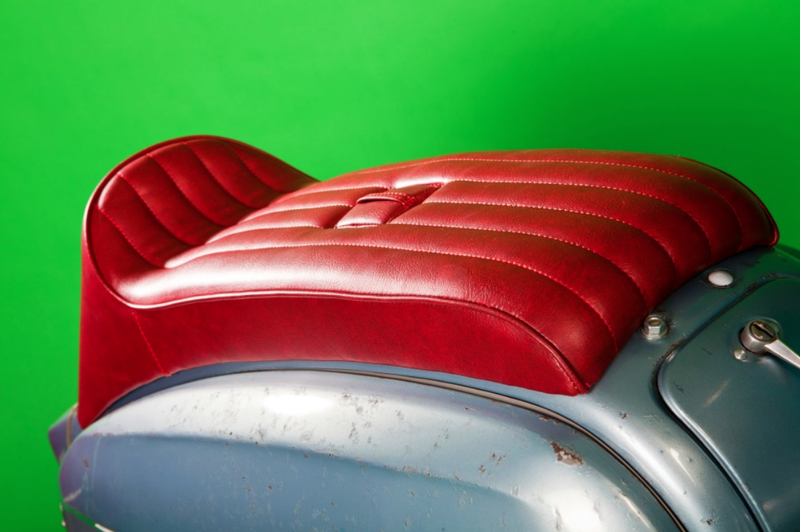 Normal Lambretta Service will be resumed shortly. 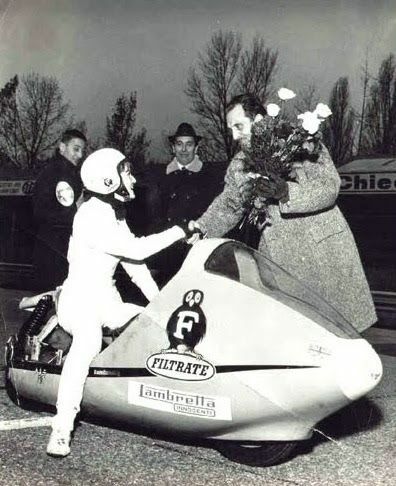 1965 Milan to Taranto – The toughest scooter trial in the world? 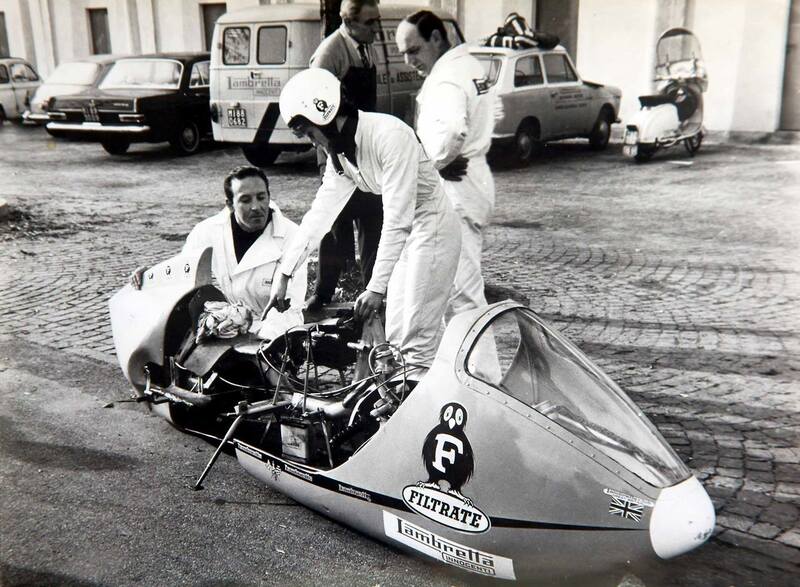 Pete Davis of the British Lambretta Archive sent me this fantastic pic of a couple of LCGB riders in the 1965 Milan to Taranto a 1,000 mile regularity trial, a event organised by the Lambretta Club d’Italia. …and a fantastic article on the ever excellent Team S Equipe blog, here. 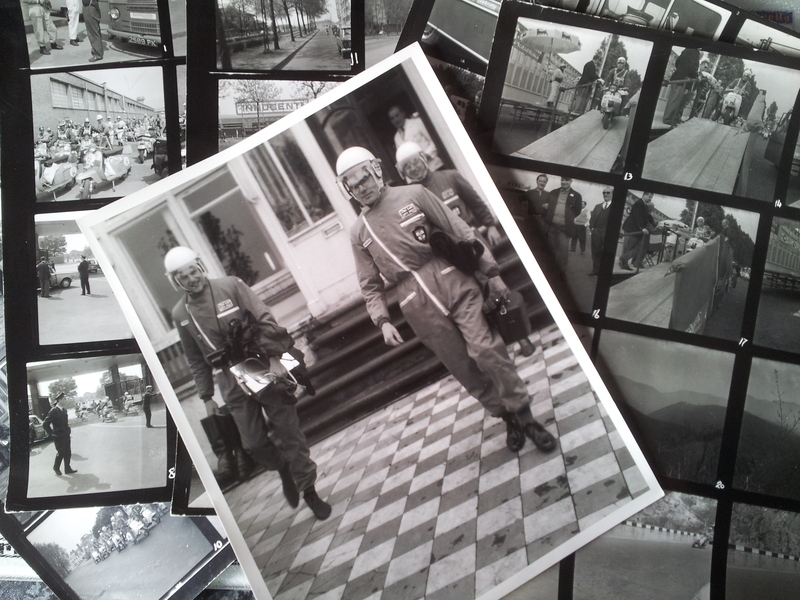 Can YOU help track down Filtrate Lambretta pilot Marlene Parker? Back in 1965, Marlene Parker, a 22 year old Bristol Taxi driver, was selected from 67 female applicants from across the country to ride a Lambretta scooter in Monza in Italy and break the world record. 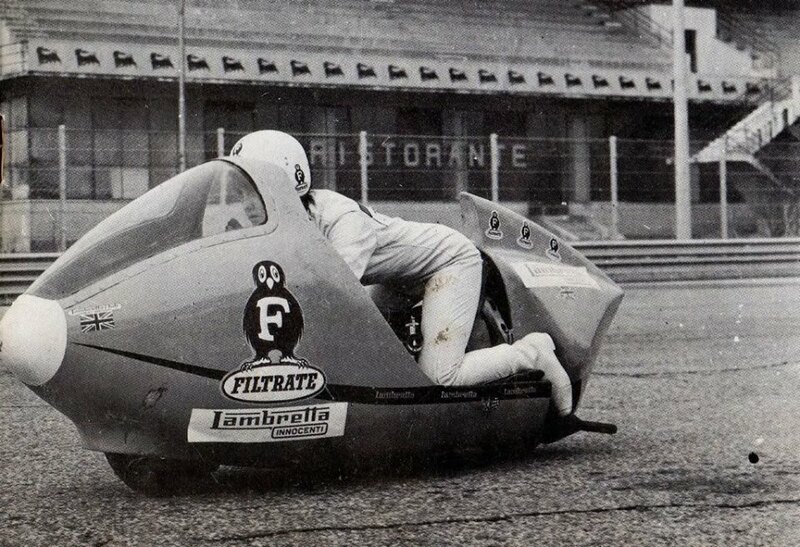 Marlene went on to ride the Filtrate sponsored Lambretta to a record beating 110 mph. 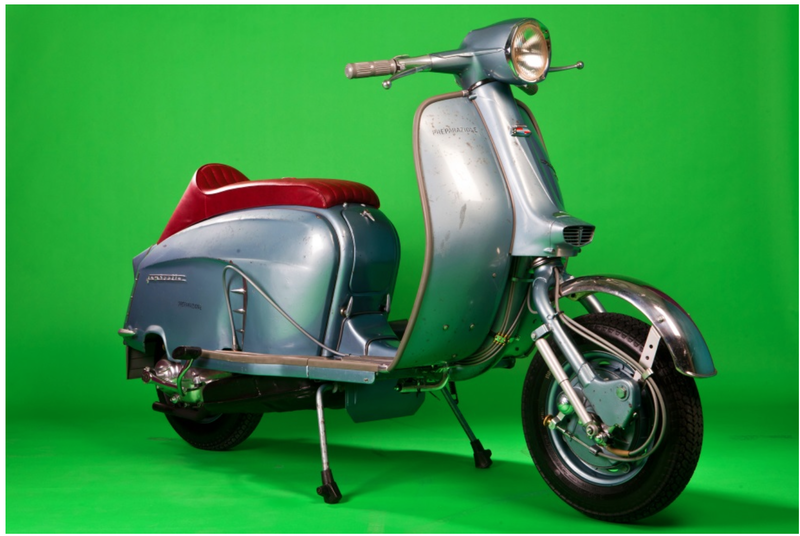 Now, nearly 50 years on, the team behind this record is reuniting… and they’ve even found the original machine, which in now in the hands of The Scooter Center, the German specialist scooter shop, who intent to completely rebuild it and return it to its former glory. The Bristol Post has got behind this story, and is helping try to track down Marlene. Their reporter, Emily Koch, would love to hear from you.You can Email her here, or phone her on 0117 934 3412. Read more on the Bristol Post site. UPDATE: In my eagerness to stick this post up, I didn’t realise the original Bristol Post article was from 2009… so it may well be that Marlene has been located. I’m attempting to follow up the story, if you know more (has it been in Scootering for instance, and I missed it) lat me know and I’ll run an update. Another one. 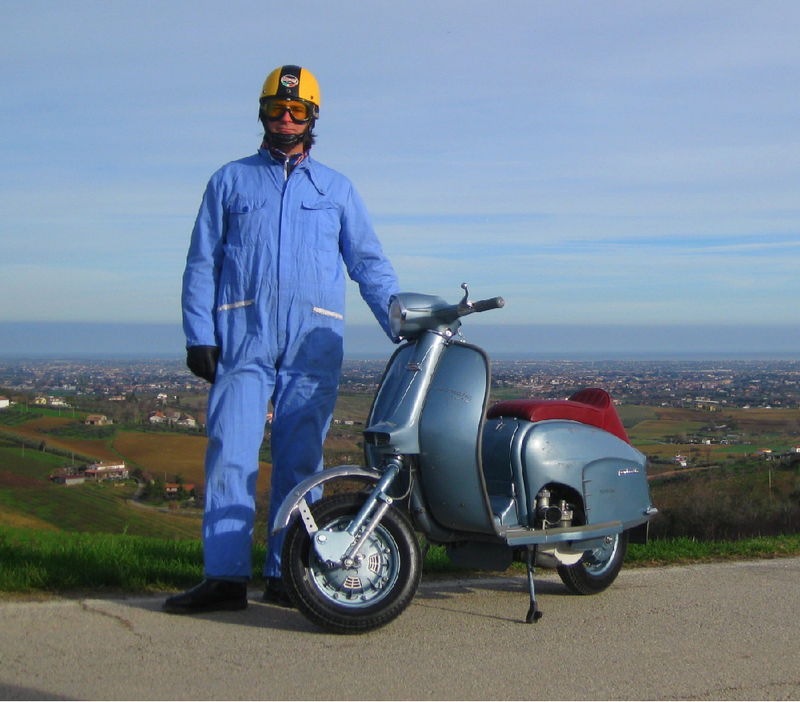 This is my third post about the work of The Rimini Lambretta Centre. I make no apologies for this, they produce first class work, and they are the acknowledged experts in the fine art of the “conserved restoration”. Coupled with there usually being an interesting story behind the work, and some great images, it’s a no brainer. So, on with the post, and what we have here is another fantastic job, on a small, but important piece of Lambretta history. The owner, Marcello Taglialegne, picked up this machine, in a really sorry state, at a parts fair. Some nifty homework confirmed the sellers’ story that it was an Ancillotti original, and, although the bodywork was in a bad way, with a massive crack at the rear section of the frame, and the engine was missing, it was decide that this scooter MUST be saved! A ton of work was done. 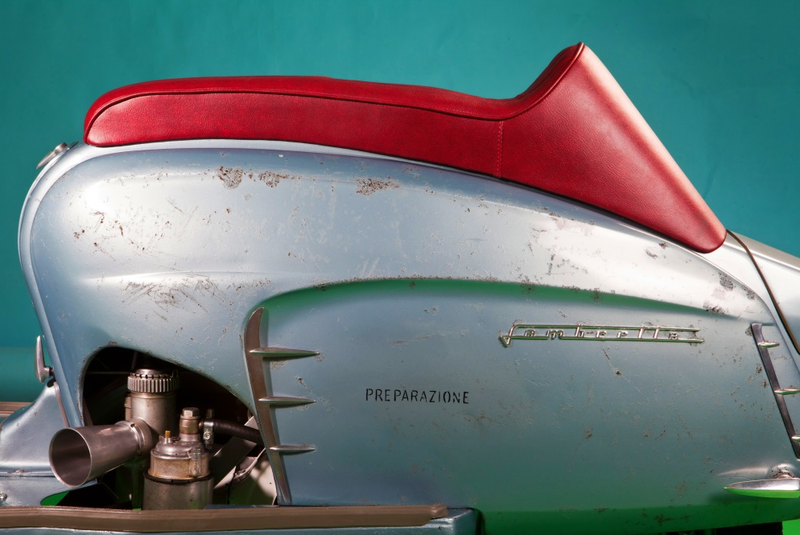 This included sourcing a NOS 200cc engine as originally used by the Ancillotti brothers, and a hand-made inlet manifold to house the unfeasibly large Dell’Orto that sticks out the side of this scoot like Satchmo’s horn. 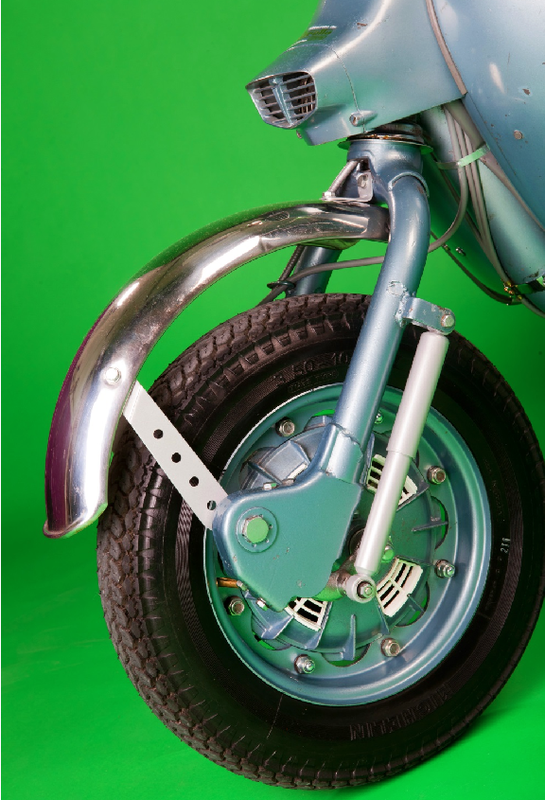 The other thing that draws your eye straight away on this unique Lambretta is the front mudguard, which looks like it’s on backwards! A point of ‘heated debate’ in the RLC workshop, it was the way Ancillotti originally did it, so it was going on like that. I kind of like it, and have certainly never seen anything like it before. But my favourite part of this scoot is the seat. What a seat. Original to the scooter, and recovered, it sets the whole scoot of beautifully. The first time I ever heard the word Ancillotti was in relation to scooter seats (back in the day, it was that or a “Snetterton”) and this is the daddy of all Ancillotti racing seats. I want one like that! For the full story of all the painstaking, period correct work that was carried out, and it’s quite a saga, but a good read; see the RLC website. There’s lots more pics of this fascinating scooter on there too. It’s been a long time ambition of mine to own, and ride, an AF S-Type, or a faithful replica of one. Seen by many Lambrettisi as the pinnacle of what you can do with the Lambretta, I think they are pretty much the perfect balance between performance, reliability and style. I’ve even got my colour scheme and sticker placement already planned out. But there’s a couple of points I’m unsure about. Would I have two pathfinders, or just the one? 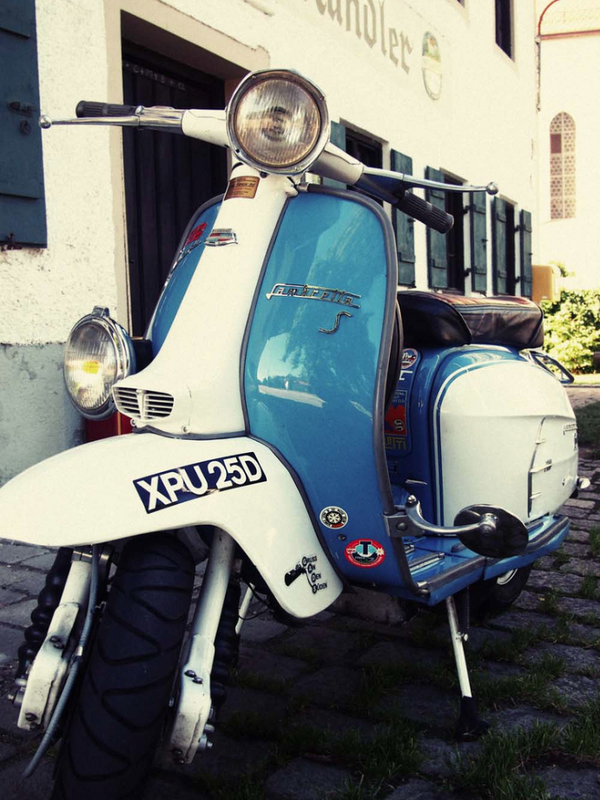 I’ve always thought two… but this scoot looks so right with just the one. And would I have an inline spare wheel carrier, or tuck it behind the ledshields? Decisions, decisions. Well, as I’m potless at the moment, these vital choices can wait. For now. But when I get that windfall… there are tough choices to be made! 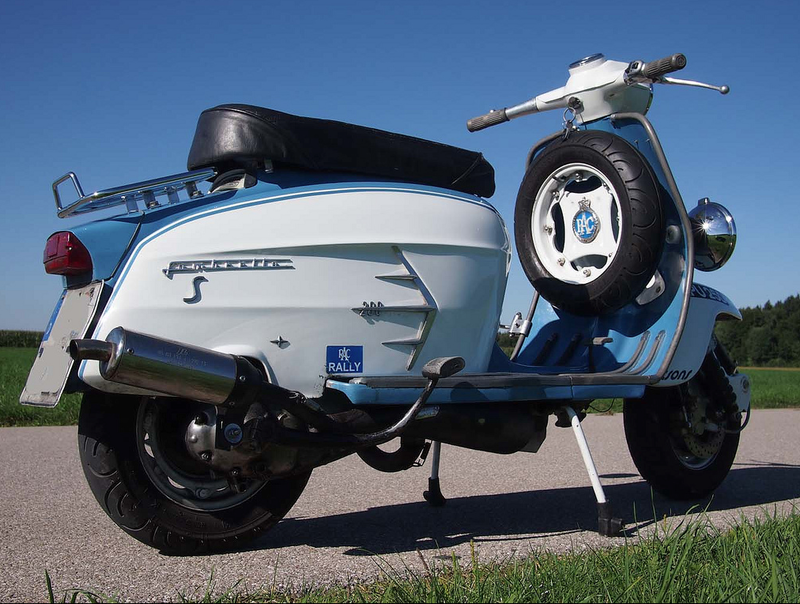 This glorious S-Type Replica is owned by Stefan, who is behind the excellent Get Around Better Lambretta Photoblog. Another great blog to follow! UPDATE: Stefan has been in touch with a few more details about his pride and joy. But first I’ll fill you techy types in on what’s under the panels. The engine is a TS1 225, with a Mikuni TMX 35mm carb and Taffspeed road pipe. A front hydraulic disc, Raydot foglight and Smith speedometer and Ancilotti seat all give it the authentic AF Rayspeed look. But putting together a UK ‘dealer special’ replica in Germany wasn’t all plane sailing, an iIt’s the little details that caused Stefan the biggest problems. 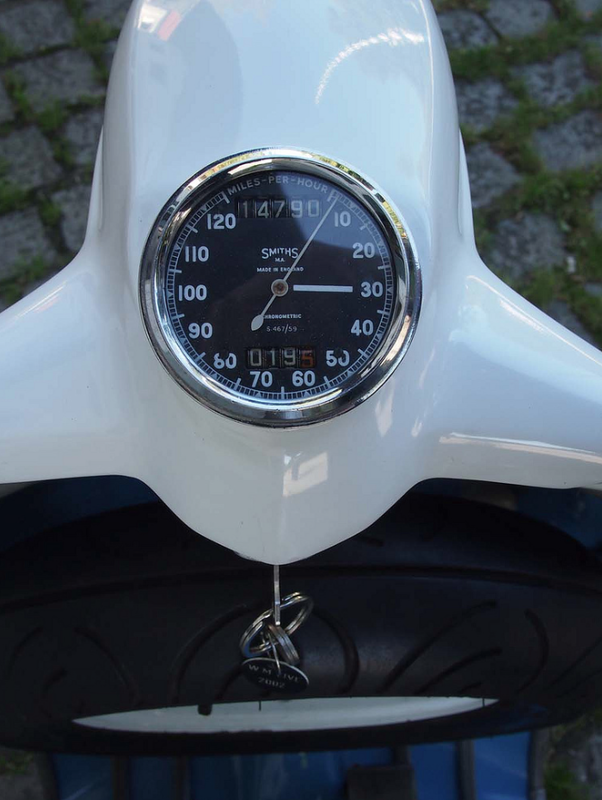 On a scoot like this is all about getting the details right… the rubber for the Raydot took some tracking down, and he had to persuade the guy who’d commissioned 100 “225” badges just to get three for his one scoot to let him buy some! Still, it has all come together to produce a first class machine. Nice work! This great bit of scootering history has just been posted on YouTube… The Lambretta Club of Great Britain racing at the Thruxton circuit in Hampshire, back in 1969. I’m assuming they hired the circuit for the day… they seem like they had a decent membership back in the day! The footage features several names that may be familiar to aficionados of the racing scene, Roy Bradford, Nev Frost, and the Ronald Brothers. GP225WildCat has posted a number of other South Devon Lambretta Club vids on YouTube, all of which are well worth checking out! There is even more great stuff over at the Retrobubble website, mainly from the late ’50s to the 70’s, but some 80’s stuff too. All available to buy on DVD. As I have only just discovered this site myself, a full ‘review’ will be forthcoming, shortly!